Breakfast 6:30am-11am Monday-Saturday. Breakfast 6:30am-1:00pm Sunday. Offering uninterrupted Pacific Ocean views and inspired seasonal cuisine, the casually sophisticated Vue at Laguna Cliffs Marriott Resort & Spa are undeniably Southern California. Begin your day with coffee and breakfast on the outdoor terrace. Enjoy our Avocado Walnut Pesto Crostini or the classic Eggs Benedict. Complete your dining experience indoors or outdoors with our ocean-views. We’re here celebrating our Easter for the first time. Price was a bit much for $50/adult, but I’m sure that’s because of the location. Really loved having the brunch outdoors. Would have really liked allowing customers’ children to get pictures taken with the Easter bunny. However, our nephew did enjoy himself, so that’s a plus. Thank you for the Five Star review!! We're here to provide a great and memorable experience and can only do that with great feedback from our guests. We'll definitely consider your comments and photo opportunities we can add in. Happy Easter! We had a great table with a wonderful view of the ocean and thew grounds. It was a buffet brunch. The food was good and for those foods that had run out, or were not apparent at the buffet, the wait staff was very gracious about bringing it to us at our table. The service was very good, the ambiance beautiful and serene. It was a great brunch with my mom. Thank you for the great review! We're glad you enjoyed your time with us and we hope to see you again soon. The manager and our waitress did a great job of accommodating our party of 14—even though half of our party arrived late. It was a wonderful meal with a perfect view of the water on a glorious day! Thank you! The Vue was awesome as always. Hermero our server was amazing. They were accomadating a convention and handle us up and above. Will definitely return. this is really just a coffee shop atmosphere. very limited menu for dinner. the valet parking was an outrageous $20. Such a gorgeous view of our Pacific Ocean. Clear skies, bright sun. Love the windows, food, and service. It's our Sunday "go-to" brunch. I gave 2 stars for a mix of reasons... I would have only given 1 for all categories, but the manager took off 1/2 the bill for the poor experience, so I gave 2 instead of 1 bc we got a discount. We ate here on New Year's Eve. Apparently the restaraunt was way understaffed. We had terrible service and food took 1 1/2 hours to come out (that is not a joke or an exhaggeration. We sat down at 8:10, ordered at 8:20 and food did not come out until 9:50). The server rarely stopped by our table to ask for refills or update us on our food (maybe once every 25 minutes). I actually walked to the bar to get my own drinks and cleared my own plates. I felt bad for the server because he seemed new and was nice, so I talked to him after dinner to give advice bc I was in the restaurant industry for a few years. The manager and other staff were not helping out like is supposed to happen when restaurants are busy and understaffed. Everybody seemed nice, but the food was not what I would expect from a nice restaurant. Lamb was overcooked, rest of food was just okay. My date and I made the best of it bc it was New Year's and we were going to attend the party upstairs later. But had it not been New year's,we would have walked out. Nice location for an early evening or sunset dinner. Food was good. Great place to have a drink or lunch outdoors. Unfortunately, the restaurant was not prepared for New Year’s Eve! We had over a 2 1/2 hour wait for our food. Our server was awesome but no one from management checked in with us once. Luckily our meals ended up being comped. We appreciate that for sure! Food was good so we will try again another time! Could have been just the day but all the food st the brunch was bland. Went for breakfast buffet. Food was OK, but nothing to write home about. A bit light on fruit and juices. Big disappointment was cappuccino - barely any liquid and mostly horrific foam. Nice location not too fancy but nice. Hotel nice for out of towners and reasonable compared o some of the more costly resorts yet in same setting. We went for the Thanksgiving dinner, which was quite good and reasonably priced, especially in comparison to some other area restaurants. The portions were huge, so we even brought leftovers home just like at family Thanksgiving dinners back east. The views are wonderful and we were very pleased with the service. Food was good but was disappointed in the décor of the restaurant. We were stuck in a side small banquet room but there were no centerpieces or décor of any kind. Waiter was very attentive and did a great job. We ate at VUE for Thanksgiving. The staff and service was exceptional but the quality of the food was average. The location is terrific, nice ocean views, etc. This place was horrible. We made a reservation and when we arrived we asked to be seated outside and it was full...even though there were empty tables. We asked to be seated inside at the window... Those too we were told were occupied. We ordered our drinks and meal. 30 minutes later we were walking around the restaurant trying to find our waiter. We ended up getting our breakfast 10 minutes later. Btw, no one sat in any of those empty tables that we couldn't have the entire time we were there. Interesting visit. When we arrived the hostess had no idea what an Open Table reservation was. She had a table for us anyway. The service was mixed. Our waitress was very nice, and tried hard it seeemed. But everything was extremely slow. 20 min after placing an order to get a drink and another 20 for food. Dirty tables not cleaned off. Food order with item missing but quickly fixed. Luckily we were in no rush and wanted to spend time visiting. The food was excellent, and the “vue” is awesome!! We will go back! Wow! My husband is hard of hearing and they put us in a section that was closed. The manager an Hamero were awesome. They were super attentive to our needs. The food was outstanding. Definitely will return. Food was over cooked, and not what they said it would be like. The crab cakes had more bread that crab meat. They went to pack up my food and never came back. We were never asked how our meals were. Waiter disappeared on us several times. Hard to locate restaurant. Not impressed with the view. Something was in the balsamic bottle. Service was great but that’s about it. Group of 12; both our Server, Austin, and the kitchen staff exceeded expectations. Everything flowed from start to finish, allowing us to thoroughly enjoy the evening setting outside, and the company on hand. 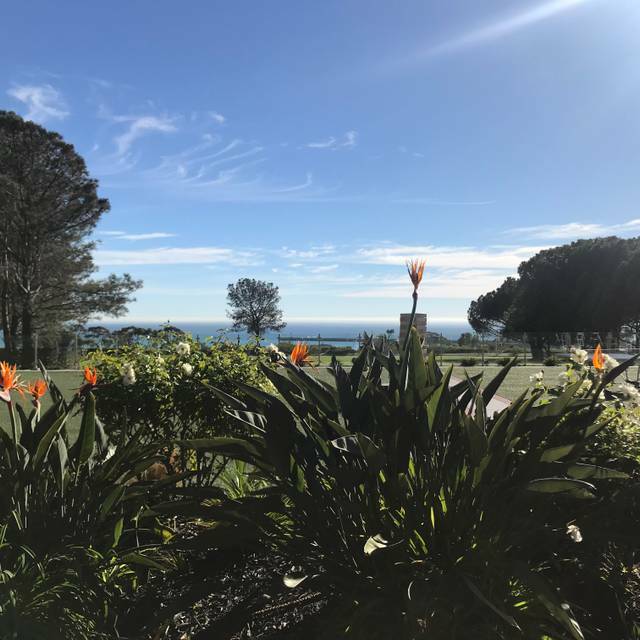 The dining experience parallels the same service I have experienced, with both my business and personal stays, at the Laguna Cliffs Hotel Marriott. The food was good and fresh. Our waiter Homero was fantastic. The hostess seated us right away. I am a definite customer! It’s a Marriott Resort🙁Too many kids and very very loud. Children running everywhere and playing with beach balls in the dining area. No music! Poor ambience. I will not return even thou the food and service was excellent. I hard been there before and i loved it. Not so good today. If you are lucky they will seat you outside where is beautiful but even with reservation we were sat inside which looks like a cheap cafeteria. Not worth it. The waitress was super nice but the busboys very rude. great service, wonderful foo. and a beautiful view. Don’t go there, you will be disappointed!!! The food is ok, but the service is horrible!!! The servers were very rude , and it’s not a kid friendly place, the room was dark we could hardly see each other! Went for Mother’s Day. Our waiter was pretentious and condescending. My dad ordered a burger. It came out with the wrong cheese on it so he sent it back. When they brought it back out, it was clear they just scraped off the other cheese and gave him the same burger. It was also cold. He sent it back again. Third time was correct and he really enjoyed it. I ordered pizza with gluten free crust. It was eh. My mom’s salmon was excellent. The food and beverage manager was very helpful and courteous though should have comped my dad’s burger but did not. The restaurant itself was bright, modern, and cheerful. Food was terrible. Three of us didn’t eat our food and it looked like either the kitchen or waiters were under staffed. Restaurant was not busy but food took forever. The actual view area we wanted to sit in was closed due to construction so we ended up in what looked like any Marriott dining room. Won’t go back. Beautiful setting in the Laguna Cliffs Marriott with a gorgeous view. Service was excellent and the food was good. We will definitely go back! We had no idea how expensive this place was. I searched for under $30!! Not even close. Feel horrible that we spent this much with 3 kids eating mostly cereal. Beautiful setting but will never go there again. Went for lunch, pretty much empty about 6 tables with people. Food was good, service was awful. Ive never had such bad service. First we ordered waters to drink then we ordered our meals. Bread was brought to the table but no plates, it was hard to get anyones attention fir them. When our food came that was the last we saw him. We didnt get our water filled once and we filled our own from our own bottles because we were desperate. It took forever to get our check as well. I will never go back there. The hostess was fantastic. The food outstanding. The restaurant was clean. Our service was horrible. Jose was abrupt and provided no service. We had to find clean glasses and asked another server for hot coffee. Tasty wine with a view - they comped the valet for a short stay which was unexpected and appreciated. I enjoyed everything about the evening. The food, the service and the Vue! Service was excellent. Loved our wait staff. And we have a lot of needy kids. Off one of the ballrooms and they used to have an amazing seafood buffet ... with large prawn shrimp ... loved the ham ... but would like to see roast beef maybe as well. Honestly - it was a beautiful day and a great experience.